YWCA NCW and 12 Tribes Resort and Casino present: Standing in the Shadows, the second of four panel discussions in 2019. 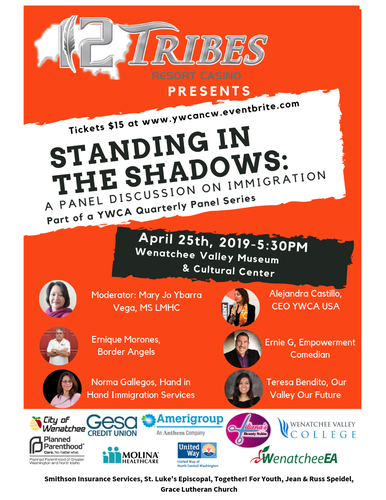 YWCA NCW is requesting the public attendance April 25th at Wenatchee Museum and Cultural Center for this quarters topic: Immigration. Featuring YWCA USA CEO Alejandra Castillo as a panelist. Tickets can be purchased for $15 at www.ywcancw.eventbrite.com, panel and discussion start at 5:30pm.